Tuesday, March 30, 2010: Up to clear skies with temperatures in the 70’s. After a nice breakfast we set out at 1015 and made the short trip to Newport, North Carolina to visit our old friends Pam and Joe. 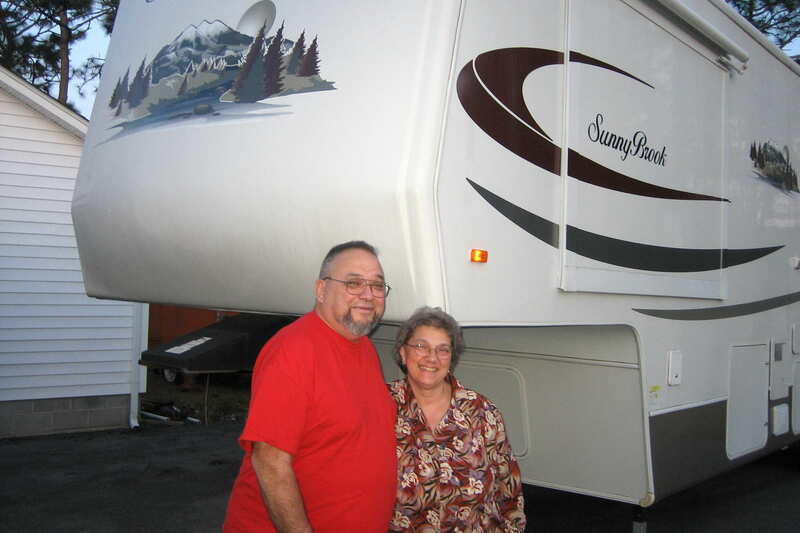 As you can see they have caught the RV bug as well. Joe is a retired Navy Warrant Officer and he and Pam were our neighbors in Virginia Beach back when I was stationed on a Norfolk frigate from 1976 to 1980. We have remained in contact ever since and don’t miss a chance to stop to see them whenever we are in the area. We did accept their offer to “dooryard surf” in their large circular driveway and enjoyed a peaceful night in their rural setting. Our little trailer did become a bit nervous by their large 5th wheel sniffing around but everything worked out just fine. We are expecting a “pop-up trailer” which should be due in December. We had a great time visiting, reliving our experiences in Virginia Beach and catching up on each others lives. We joined them at a nice restaurant for a very good meal and continued the visiting over coffee. It’s always enjoyable to visit with Joe and Pam but tomorrow we leave to continue our trek north. Wednesday, March 31, 2010: After joining Joe and Pam for coffee and pastries we headed out on US-70 toward the Outer Banks of North Carolina. Originally wanted to take the Cedar Island ferry to Ocracoke but it was already full so we called the Swan Quarter Terminal only to discover the next boat wasn’t to depart until 1700. Not wanting to wait that long, we hopped on US-264 instead. We noticed the dogwoods were in bloom everywhere and all the rivers were a bright blue. Most of the rivers in the south and west are kind of a reddish brown so we new we were getting close to home when we started spotting rivers of blue. As we approached the coast we noticed quite a few homes on stilts, even some mobile homes. Arriving on the Outer Banks of North Carolina, we discovered that Cape Hatteras National Seashore was not open for camping until later in the month. Since there were no military campgrounds in the area we selected a commercial facility to camp in for the next two nights. 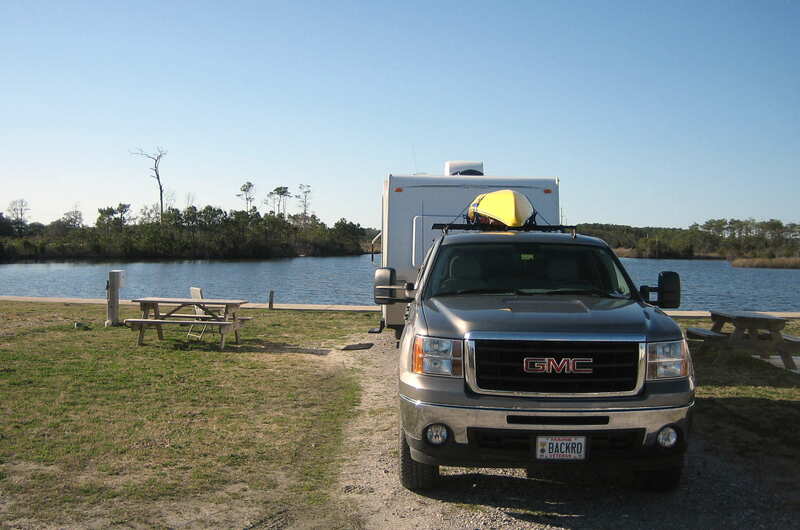 The Refuge Campground is located on Roanoke Island in the town of Wanchese, North Carolina. It turned out to be a nice little place on a small pond. We paid for two days, unhooked the trailer and prepared for tomorrow’s adventures…..whatever they may be. Thursday, April 1, 2010: Left the campground early under clear skies and warming temperatures crossing over Roanoke Sound to Bodie Island. We then headed south on US-12 towards Cape Hatteras stopping frequently to sightsee, shop, eat and take pictures. 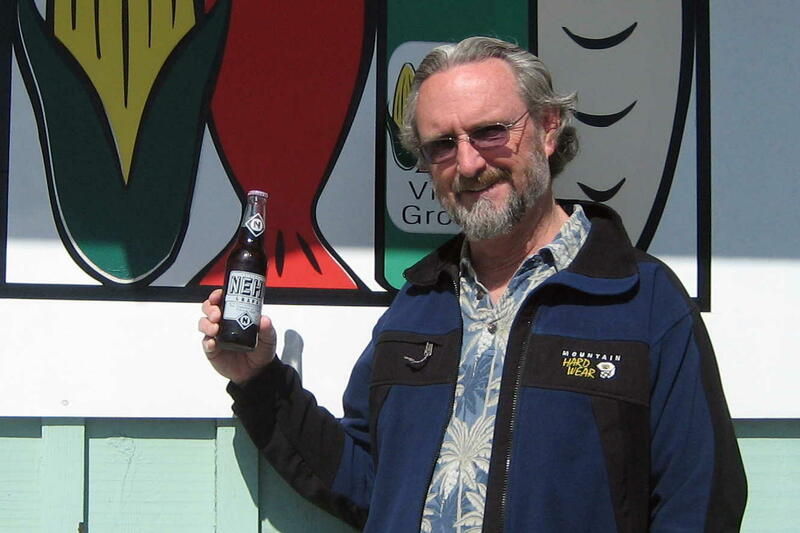 At a small village general store I discovered my favorite soft drink from childhood. Grape Nehi in glass bottles. Had to buy and enjoy one…..it immediately took me back to long summer days in San Diego. 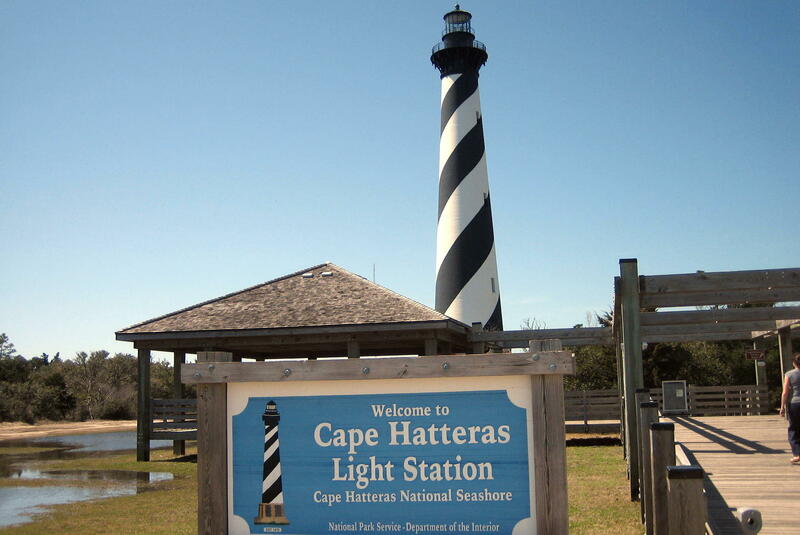 Arriving at the town of Cape Hatteras we pulled into the Cape Hatteras Light Station National Park Visitors Center. 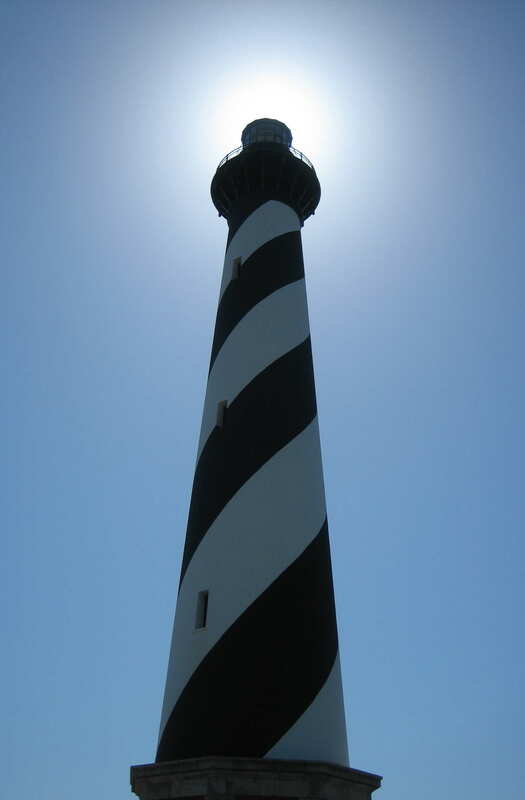 With the cooperation of the sun I was able to snap the following shot of Hatteras Lighthouse. For some reason I spent the next few hours with this orange spot in my field of vision…..hope it goes away. 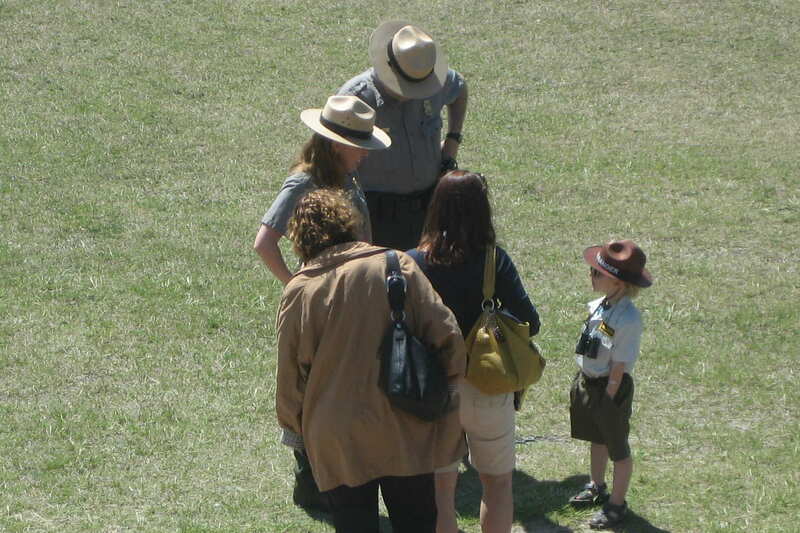 The National Park Ranger staff at Cape Hatteras Light Station had a unique member. The ranger on the right couldn’t have been more than three feet tall and looked to be about seven years old. I think he may have been hired to climb up into the tower each morning and blow the lighthouse candle out…..no sense wasting wax in this economy. 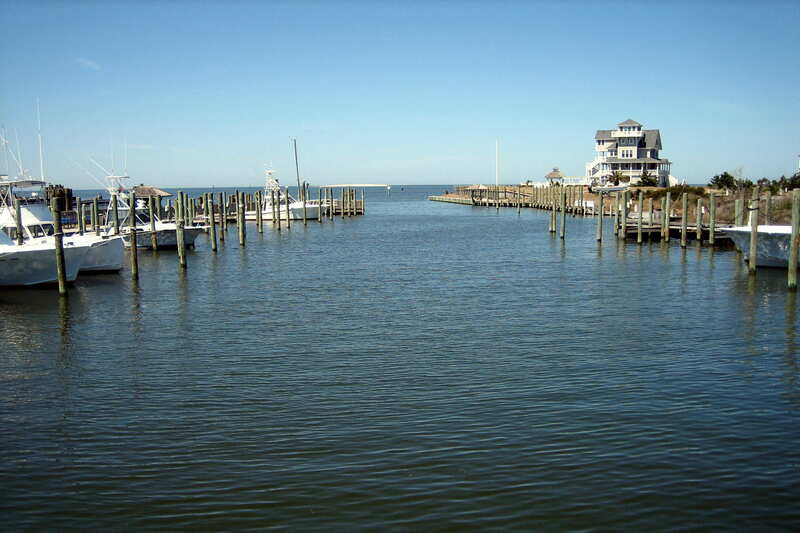 In the town of Cape Hatteras we poked around the waterfront a bit and strolled around the village. Since this was as far south on the outer banks that we could drive without getting wet we headed back north on US-12. 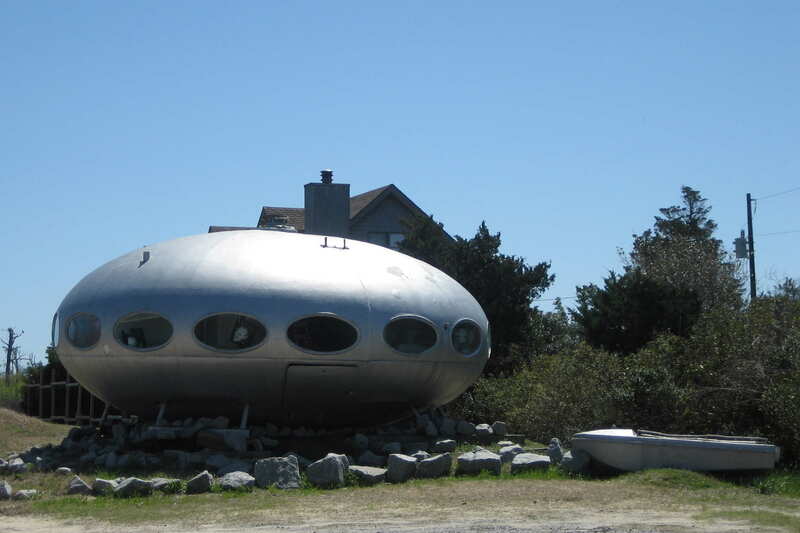 On our return trip up the island we spotted this illegal alien vehicle. Now all those border patrol folks we saw out west are wasting their time…..apparently the preferred point of illegal entry into the US is through Rodanthe, North Carolina. Before returning to our campsite we drove into the town of Kill Devil Hill’s where we had a great meal in a 1950’s style diner called, what else……The Kill Devil Diner. After dinner we drove around the area a bit before returning to The Refuge Campground for the evening. Friday, April 2, 2010: Up early, broke camp and headed for the Wright Brothers National memorial where we stopped at the visitors center. 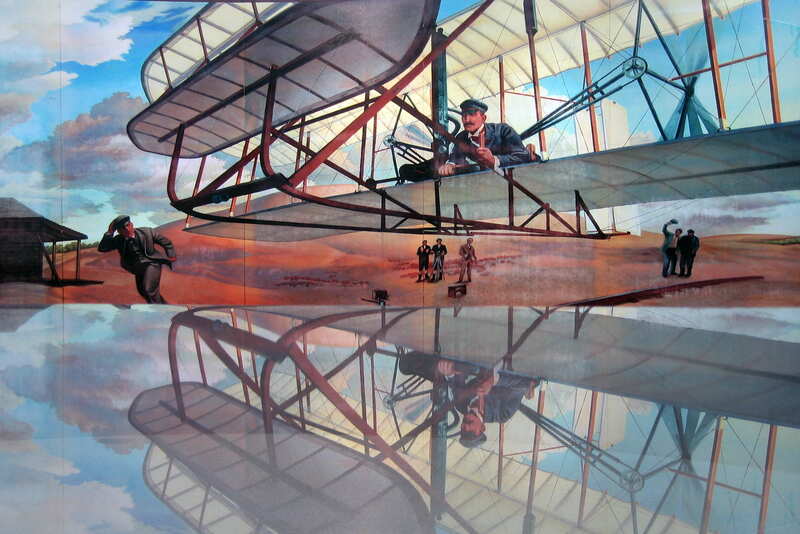 As any schoolchild can tell you, Kitty Hawk was the sight back in 1903 where Orville and Wilber Wright successfully made the world’s first controlled flight in a heavier then air machine powered craft. These two brothers from Dayton, Ohio who had left high school before graduating only to work as bicycle mechanics accomplished a feat that had eluded mankind. In order to see how hard their historic flight really was and to recognize the 100th anniversary of manned flight there was an attempt to duplicate their experience in 2003 by an organization called “The Wright Experience”. 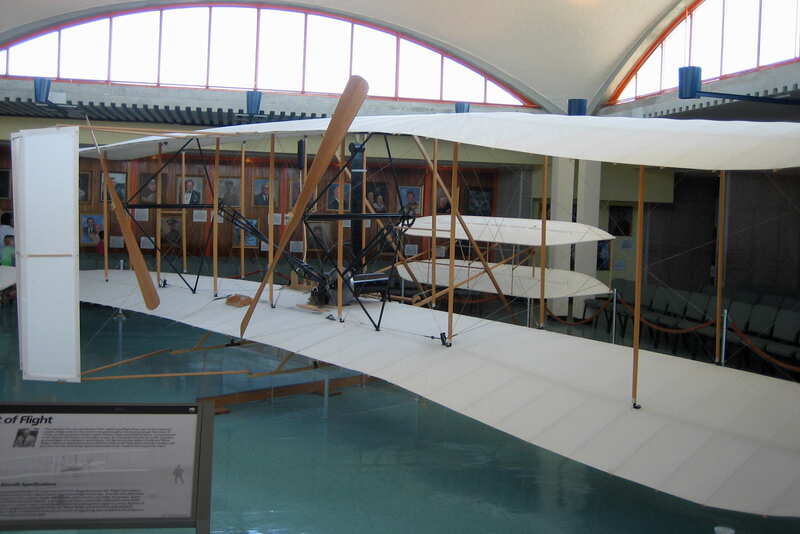 A distinguished group of Aeronautical Engineers, Scientists and Wright Scholars were assembled to build a 1903 style Wright Flyer using only the materials and tools available in that era. Their aircraft took to the air; traveled 97 feet and crashed (The following photo is form the web showing the attempt in 2003). 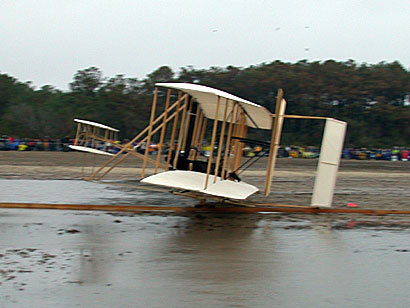 The Wright Brothers aircraft made 120 feet before coming to a graceful landing. Pretty impressive for a couple of high school dropouts! Even more impressive when you consider a mere 66 years later Neil Armstrong was strolling about the surface of the moon. 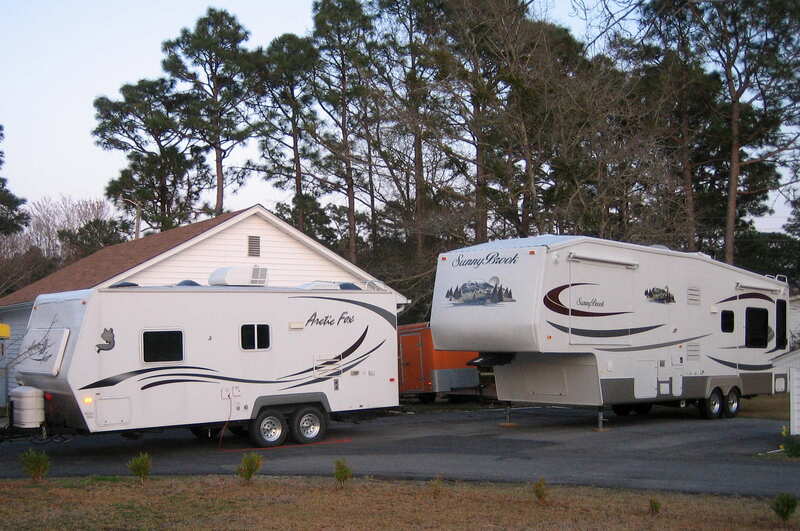 Continuing on our journey north toward the Norfolk, Virginia we pulled into Ocean Pines Navy Campground which is located right outside the gate to Oceana Naval Air Station. This RV park used to be a mobile home park so all the sites were full hook up and very large. Since we were to stay here for a few days to explore the area it worked out very well. Thursday, April 1, 2010 to Monday, April 5, 2010 Virginia Beach, Virginia: We spent most of the time here enjoying the nice spring weather, poking around our old haunts, taking care of domestic chores and basically just veggin out. 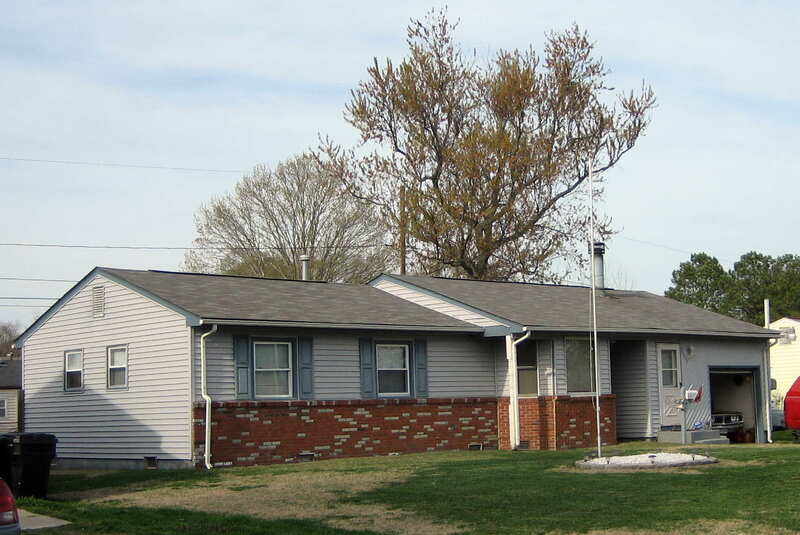 We did tour our old neighborhood in Virginia Beach and discovered that the first home that we actually owned back in the late 1970’s was still looking pretty good. We also drove into Norfolk and poked around the Naval Station where my ship had been home ported. The base looked pretty much the same but now days all the warships were AEGIS Cruisers and Destroyers with a smattering of carriers, amphib’s and supply ships. We stopped at the Navy Exchange to do some shopping for necessary, and not so necessary, items. We also visited the Lynnhaven Mall…..a ginormous shopping complex on two floors. Back in 1978 this area was nothing but an open field where strawberries were grown every spring with a few mom and pop type stores on the road frontage. We lived in the Bow Creek area of Virginia Beach which was just a few hundred feet from the field…..and now from this huge mall. Wow, have times changed! What hasn’t changed however is the roar of military fighter jets from Oceana Naval Air Station in the skies over Virginia Beach. To some it is nothing but noise pollution; to me it is the sound of freedom. Kit’s corner: We thoroughly enjoyed visiting with Pam & Joe and catching up on our families and what’s going on in our lives. We were fortunate to have such nice weather over the Easter weekend to explore Virginia Beach and have a couple of down days to relax. So many times in years past, we have raced up and down the east coast due to work schedules, etc. It’s nice to have a slower pace and finally, after all these years, explore and enjoy the areas we never had the opportunity to see.